These pages document a personal collection of around 2700 books with dust jackets in over 400 different publishers book series published from the 1890s through the 1980s. The books are appealing as they allude to a largely undocumented history of personal, home library books for readers of modest means. These pages provide basic documentation for the many publishers series that don’t have much documentation anywhere else. Excellent resources exist for the Modern Library and Everyman’s Library, but there is nothing even close for other series. Information and images assembled here provide some background and empirical data about the books, their jackets, the range of titles in the series, book and jacket changes over time, and publishers. This work including all pages and their text and images, other than those freely available elsewhere, is licensed under a Creative Commons Attribution-NonCommercial-ShareAlike 4.0 International License. In the last few decades, there has been growth in scholarly interest in publishers reprint book series. The two volumes of The Culture of the Publisher’s Series, Vol. 1 and Vol. 2 (2011), edited by John Spiers, highlight this growing area of research. Publisher’s reprint series are of interest in terms of their relationship to the shaping of the public’s literary taste, in particular with “common” readers who could afford to buy cheap series books and assemble a home library. Publisher’s series also speaks to the development of the book trade, the marketing of books, the role of copyright, the shaping of “the canon,” and the social and human context within which these books are embedded. Lise Jaillant examines the impact of book series on the development of literary modernism in the 20th century. Cheap Modernism: Expanding Markets, Publishers’ Series and the Avant-Garde (Edinburgh University Press, 2017) uses series such as the Oxford World Classics, the New Adelphi Library, and the Phoenix Library as a way to argue that cheap, modernist literature – via inexpensive publishers’ series – was an important component of the emergence of literary modernism in the 20th century. Dust jackets too have received increasing attention. Long ignored by most bibliographers and literary researchers, jackets were also likely to be thrown away much like the packaging for any product. Scholarly efforts have attempted to address the importance of book jackets, examining their graphical character, the role they play in marketing, and the information found only on jackets about books and authors and publishers. A good example of the latter issue is the fact that some of the series books on these pages include the series name on the jackets only (there is no indication in the book itself that it is part of a series). It is relatively easy to find reprint series books, but much more difficult to find them with jackets. Jackets were not uncommon in the 1860s and probably used on most books by the 1870s. It is safe to say that many series books published after the 1870s had jackets, although very few have survived. In addition, few of those jackets were preserved on the books they were issued with by libraries, so it is nearly impossible to find accessible systematic collections of publisher’s reprint series and their jackets. I typically do not include books here missing dust jackets. I do include books that came wrapped in tissue or in a box or sleeve. Most series books from the 1870s onward had jackets, so they are an important part of the book. There were certain kinds of series books that were issued without jackets such as book series sold in quantities to schools. These can usually be distinguished by extensive information (including series name, serial number, and other details) on the book cover itself: information that would have been on a jacket had it been issued. G. Thomas Tanselle’s Book-Jackets: Their History, Forms, and Use (2011) is an excellent review of the history of the dust jacket and their literary, artistic, and intellectual importance. He also includes a census of known 19th-century dust jackets. This site documents actual books with jackets I own: as I find copies of books from additional series the books and series will be added to the site. The entries here are not up to strict bibliographic standards nor are they complete for every series. There are series not fully documented here (many are listed, unlinked to their own page, on the Publishers & Series page). 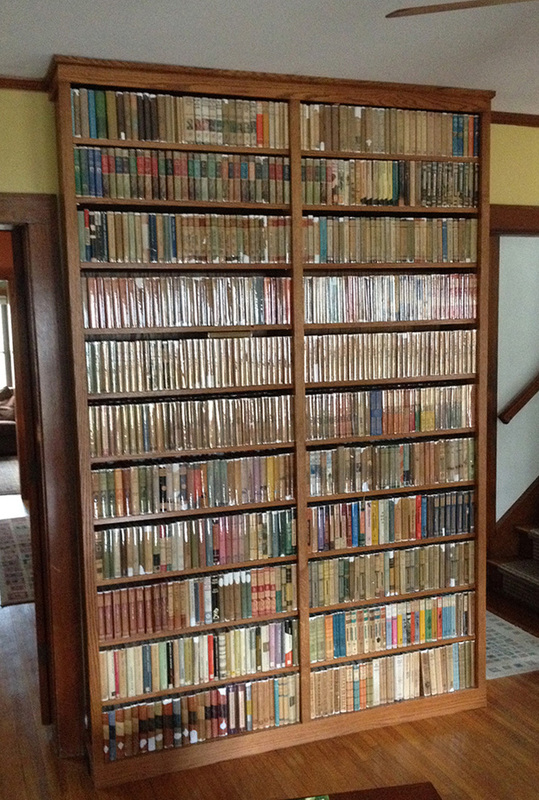 Not included here are paperback series (except some from before WW2 that had dust jackets), non-English language series, or single-author collections (sets). I also tend to avoid juvenile series (unless they are reprints of classics, aimed at a young-adult audience), scholarly monograph series (unless they are aimed at a general readership), and technical series. I appreciate hearing about errors or omissions and will happily adjust the content on these pages. Given the lack of information on most of these publisher’s book series, I’ve had to scrape together information from scattered sources and make educated guesses about the time spans of series, titles included in series, and publisher information. Information on titles in series, series & book dates, book values, book dimensions, and additional resources are below. I compile lists of titles in series in some cases, and scans of lists from jackets or books in other cases; catalogs change over time as more titles are added to or removed from the series. Slow selling titles are often left to go out of print. Series such as Everyman’s Library and the Modern Library routinely replaced titles and reused series numbers. The highest numbered regular series Modern Library book is 396, but there are around 500 regular, unique titles. Finding the ultimate, final list of titles requires research into all existing catalogs and lists of titles (from inside books as well as jackets), as well as bibliographic research on sites such as WorldCat. Scans here are a start for anyone interested in compiling titles in a particular series. Dust jackets are often vital for this kind of project. If the books themselves do not indicate the series name (eg., the series name is on the jacket only, which most libraries discard) it means the series name may not be included in library records (such as those at WorldCat). Even when the series is named in the book, library catalogers don’t always include the book series in the bibliographic entry. Publisher’s reprint series are often absent from library catalogs. If the books were out of copyright there was no reason to send a copy to the Library or Congress or British Library. In addition, libraries usually don’t acquire reprints when they already have the original books (or other reprints) in their collections. Determining the start and end years of a reprint series can be complicated. If a publisher followed typical procedure, they would include a printing date in the book. Often, with a reprint series, the original date the book was published and the reprint (or reprint dates) in the series are indicated. In this case, WorldCat is a good indication of the span of years of a particular series. Another good source for the start date of a particular series, especially if dates are not included in the books, is a search of periodicals (on sites like Google Books or HathiTrust) for publisher announcements or advertisements. The end year of a series is more complicated. In many instances, a few more popular books from a series were reprinted long after the series was no longer active. It is rare to find a publisher’s announcement that they have ended a series. On this site, I have tried to estimate when a series ended by taking into account the last title published and a significant drop in reprints from the series. The end dates are educated guesses in many instances. In dating a particular series book, only the minority of series include the actual date of the series reprint. Dates are often not included in reprint series books; the lack of a date does not mean the book is the first edition. Indeed, there are few true first editions in these reprint series as most are reprints. At best, you have the first reprint edition, which is sometimes noted in the book. If included, the date may be a copyright date for the title itself or the plates (which is often much earlier than the book was printed). Dates are in a few cases indicated on the jackets (dated catalogs) or catalogs in the back of the books. Collected Series: for example, the Modern Library and Everyman’s Library. More valuable copies include jacketed older copies and rarities. Few other series seem to have organized collectors and information sources. Collectible Authors: For example, Fitzgerald, Faulkner, Hemmingway, Doyle, the Tarzan series, etc. In these cases, condition and a good dust jacket are usually required. Collectible Titles: For example, Dracula, especially if the dust jacket is illustrated. William James’ Varieties of Religious Experience, because of its connection to Alcoholics Anonymous. New Classics Series: Alvin Lustig’s mid-century modern jacket designs; only copies with Lustig jackets in good condition. British Readers Library books with jackets, especially movie tie-in titles. Salvador Dali illustrations: Dali illustrated many books in the 1950s and copies of reprint series (such as the Illustrated Modern Library) with his illustrations can be valuable. AbeBooks.com: Of all the online used book sites, AbeBooks has the best quality control of entries and ease of searching. Useful for finding start and end dates of series (in tandem with WorldCat), seeing images of series books (if an image of the book is included). Also useful for buying books. Limitations include a large number of books without images, dealers who do not indicate series names in the entries, and the listing of books without jackets under the “dust jacket included” category (often with the false statement “issued without a jacket”). Henry Altemus Company: Contains extensive information about the late 19th and early 20th-century publisher of book series. Also includes information on other contemporary series publishers. Chronicling America: Hundreds of historical U.S. newspapers from 1836-1922 scanned and searchable. A good source for book reviews, advertisements, etc. On “Colonial” Editions & Series: “Bell’s Indian And Colonial Library” by B J McMullin, at The Book Collectors’ Society of Australia here and here (PDF). Dictionary of Literary Biography: available to academic institutions online, this resource has an extensive author, book, and publisher history information. The Directory of American Book Publishing, from Founding Fathers to Today’s Conglomerates. George Thomas Kurian. New York: Simon and Schuster, 1975. A useful, succinct supplement to the massive four-volume A History of Book Publishing in the United States by Tebbel (see below). Kurian’s book includes entries for hundreds of publishers with brief historical facts about each. Out of print, but gently-used inexpensive ex-library copies can be found on internet book sites. eBay: Inconsistent, with a range of people selling books from expert dealers to random people clearing junk out of their house, eBay’s international reach and a huge number of sellers does make it a decent site for finding obscure series books as well as getting start and end dates of series. Benefits include photos for almost every auction and (often) cheap prices for old series books. Elephind: Searches thousands of freely available full-text historical newspaper archives (including Chronicling America). For some reason, an emphasis on Australian content. 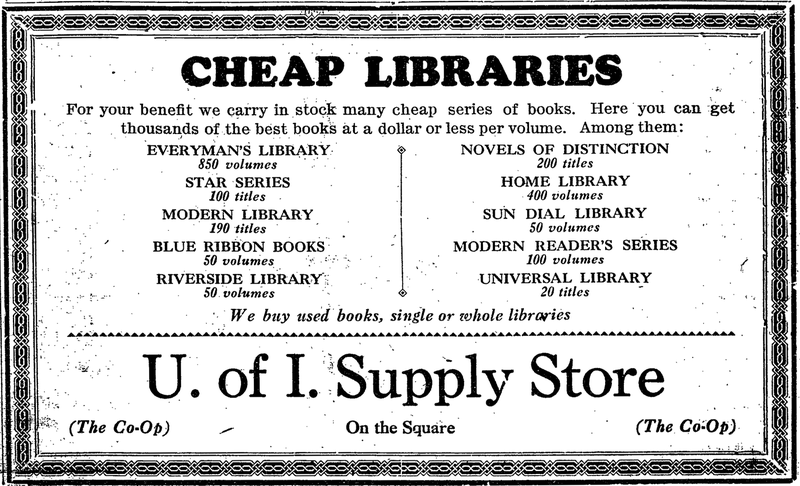 Google Books: for old publisher advertisements, series lists, dates. Limited by lack of access to full-text versions of many of the books Google has scanned. There is full view scans from about 1910 and earlier. Search for a series name then sort the entries by date to trace a series from start to end. HathiTrust: “a partnership of academic and research institutions, offering a collection of millions of titles digitized from libraries around the world.” Access to older magazines, journals, and publications which have some contemporary reprint series information. 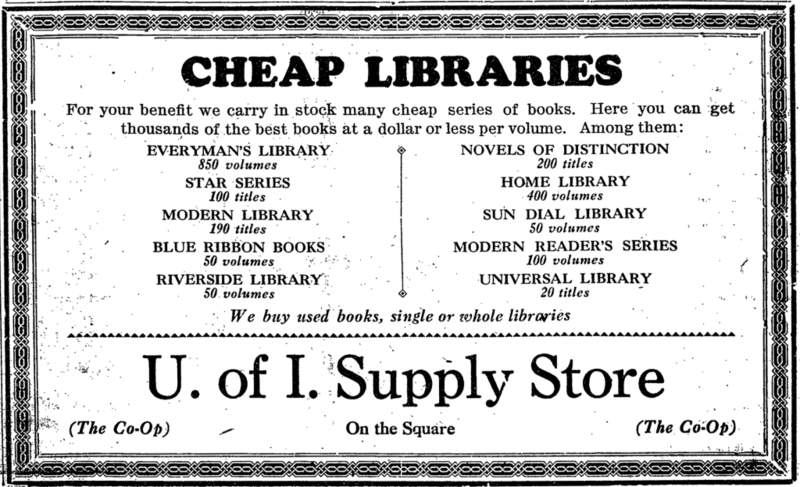 A History of Book Publishing in the United States. John William Tebbel. New York: Bowker, 1972-1981. By far the most comprehensive history of American publishing. Tebbel took on a complicated and nearly impossible-to-organize task: documenting the myriad of companies and issues that comprise the history of publishing in the U.S. To do this Tebbel worked his way through the entire run of Publishers Weekly (see below), among other materials. Thus his massive four-volume history manages to include a wide range of details including reprint book series. The volumes are out of print, but many gently used ex-library copies are available online for a pittance if you search a bit. Internet Archive: “A collection of items created by a non-profit organization dedicated to permanently preserving historically significant collections in digital form. Though it includes internet sites, images, audio recordings, and music archives it is widely known for its digitized book collections which cover everything from fiction to historical and academic texts. Both in-copyright and public domain materials can be found here.” Access to older magazines, journals, and publications which have some contemporary reprint series information. Edward T. LeBlanc Memorial Dime Novel Bibliography: An extensive list with details including hundreds of paper-bound dime novel series published in the latter half of the 19th century and early 20th century. Includes an overview of the history and characteristics of the dime novel: Paper for the People. The Literary Year-Book (Google Books). A 999-page compendium of all things book and literary related. Google Books has a full-text version from 1912. Particularly useful is an Appendix (which I have modified, rotating some pages and adding the ability to search text): “Tabulated List of the Books Contained in Ninety-Three Different Series of Cheap Book Reprints.” A list of the reprint series is followed by a list of authors/titles and which series feature them. Firms Out Of Business: A database of exactly what the title says; useful for basic information on publishers including dates of incorporation and dissolution. The Lucile Project: Documenting the numerous printed versions of the late 19th-century book Lucile (by Owen Meridith) this project has documented a broad array of reprint series and publishers active between 1860-1938 when around 100 publishers sold at least 2000 editions of Lucile. The Publisher’s page contains information about many obscure (and some not so obscure) publishers and descriptions of many reprint series which contained Lucile. Paperback Revolution: Focused on paperbound books from 1840 to the end of the Second World War. Paperback series co-existed with hardcover reprint series in this era and a primary source of competition for the book-buying public. ProQuest American Periodicals Series: available to academic institutions: Includes “periodicals published between 1740 and 1940, including special interest and general magazines, literary and professional journals, children’s and women’s magazines and many other historically-significant periodicals.” Access to older magazines, journals, and publications which have some contemporary reprint series information. Publishers Weekly: Historical copies of this periodical, published from 1872 to date, contain a wealth of information about reprint series books. Unfortunately, only selected early 20th century volumes are available as full text. HathiTrust: has some, but a significant number are searchable but not readable online. Google Books has a small number of volumes available in full text. Publishers’ Bindings Online 1815-1930: “All academic libraries have within their holdings books bound in 19th century decorative bindings. These materials are significant in their place within the fabric of American history and culture, but efforts to present these bindings in a collection that is representative of the era as a whole and to make them available virtually, via the World Wide Web have been limited. PBO, a significant digital collection of decorative bindings, along with a comprehensive glossary and guide to the elements of these objects, will strengthen the growing interest in and create broader awareness for this “common” object called the book.” In particular, the extensive glossary of bookbinding terms is helpful to identify terms related to the binding of books from this era. Publishing History: Includes book series and lists of titles in series. The most comprehensive listing of publishers series with many full lists of titles in series. Replacement List of Fiction, with Selected List of Recommended Series and Suggested Specifications for Book Manufacture. Carl Cannon. Chicago, American Library Association, 1933. An excellent overview of the characteristics and limitations of reprint series books for library use. The authors focus on all aspects of book design and construction and are critical of many reprint series lack of editorial oversight, poor typography, size, cheap paper, and bindings, etc. This report helps distinguish well-crafted reprint series from those that are cheap and marginal in quality. The report also includes a relatively comprehensive list of reprint series available in the early 1930s. A revision was issued in 1939: Replacement List of Fiction, Compiled by the A.L.A. Editorial Staff from Reports of Practice in Twelve Representative Libraries. Chicago, American Library Association, 1939. Satiche.com includes an array of diverse web resources, including a page on vintage paperback books, including paperback series books. A link on the left, Other Paperback Books Series leads to an alphabetical listing of series and links to details about particular series (including scans and lists of titles). The Times Digital Archive: A Full searchable collection of the London Times. Many publishers of UK series placed ads in the Times and there are also articles about various series, authors, and publishers. Requires a subscription (typically through an academic institution). What Books Shall I Read? F.K.W. Drury & W.E. Simnett (Houghton Mifflin Co., 1933). One of the numerous books telling you how and what to read. This guide includes Appendix A: Series of American Publishers listing series available in the U.S. in 1933. Such sources helped build the list of series found on the Publishers & Series page of this site. WorldCat: a catalog of millions of books from thousands of libraries around the world; ability to search by series if you have access to the advanced search capabilities via an academic institution. The Expert Search allows you to search by series (se:) along with dozens of other fields. Once you find copies in a series, you can limit the search by date and see the span of years and number of book entries in WorldCat. This can help pin down the start and end of a series. A serious limitation is when books don’t include the series name on or in the book itself (a surprising number don’t, only indicating it on the dust jacket). Thus you can’t search for these series on WorldCat (as libraries didn’t preserve book jackets in most cases). Here are three candidates for your site, which is very interesting and a real contribution for collectors like me. I have collected the Oxford Legacy Series, mostly on ancient civilizations. Aside from the Oxford Standard Authors series, I have collected many of the Oxford English Texts series, which are more scholarly and expensive. I have also a complete collection of the Dent Medieval Town series. I have collected other series publications which you might want to list. Please let me know if you are interested. Thanks for the information: I am always happy to receive information on series missing from the Publishers & Series list. Send them along as comments or to my email address (linked to my name on the main site page). Surprisingly useful resource! I have a handful of Cresset Library classics and your Series page helped me locate more information about the Cresset Press. Am also very interested in Dodd Mead’s Ebony Library — underrated illustrated classics —and will send to your email address a 1930s advertising card with a backlist of titles. I’ve never seen a copy of Dodd Mead’s Ebony Library. It would be great to see a scan of the advertising card. I have been trying (but failed) to access your email address via your excellent website to request a possible interview for a newspaper article.